You are here: Home › Fundraiser › Community Fun Day! 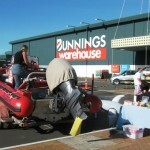 Local charities filled the Bunnings car park with entertainment and info for kids and grown ups alike. It was a big success for the ORT crew, we raised heaps of money and definitely managed to spread awareness of NZ orca (and penguins! ).